Travel season has arrived! Have you packed your nutty nibbles to tide you over until you reach your destination? Whether it’s a road trip, a cruise, or a flight to some exotic destination, it’s great to have some tasty travel companions–nutty companions, that is. Delicious, nutty and fruity companions make those nibbles even better. I never travel without packing nutty little treats in my purse, my suitcase, and my carry-on. They sustain me when food is a long way off, and all I need is just a few bites to quell the hunger pangs or feel the need for a little pick-me-up. This unique recipe is one you can prepare months or weeks in advance, pop into plastic zipper-lock baggies, and off you go. These yummy Tropical Nut Chews can travel unrefrigerated, even in extremely dry or very moist climates. 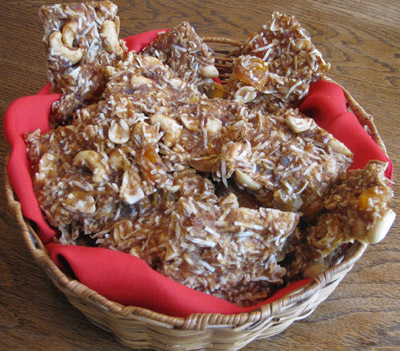 A delicious sweet treat that spotlights fruits and nuts, this tropical confection can be baked in the oven or dried in the dehydrator. Baking permits a bit more spontaneity, while dehydrating requires planning ahead for the approximately 24 hours it takes to finish in the dehydrator. Either method will bring you a delightful, chewy cookie/confection with the irresistible fruity flavors of the islands. 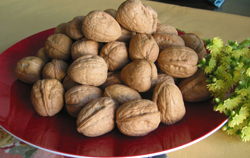 The unique feature of the nutty treats is their ability to travel well without refrigeration for up to two months. You can take them camping, backpacking, and even globe trotting. 1. Line 3 jellyroll pans with parchment paper or 3 dehydrator trays with Teflex sheets and set them aside. 2. Place the pineapple and mango pieces into a large bowl. 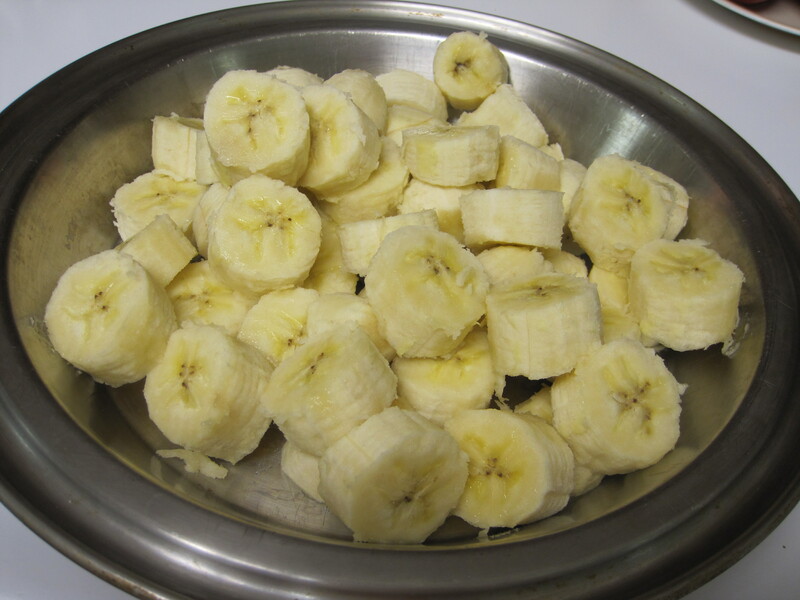 Cover the fruit with boiling water and set aside to soak for 15 to 20 minutes. 3. Combine the coconut, peanuts, cashews, and cinnamon in an extra large bowl and set aside. 4. Place half the soaked pineapple and mango pieces into the food processor, along with half the bananas, half the dates, and half the ginger. 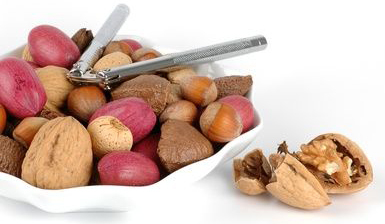 Process until smooth and creamy and transfer to the bowl with the nuts. 5. Process the remaining bananas, dates, ginger, and soaked pineapple and mango until almost completely pureed. Avoid over-processing. The small bits of pineapple, mango, dates, and ginger add pleasing texture and tangy flavor. Transfer the mixture to bowl and mix well to distribute all the ingredients evenly. 6. TO BAKE THE TROPICAL NUT CHEWS, preheat the oven to 200 degrees. Spoon the fruit mixture onto the prepared jellyroll pans and press with the back of a spoon to spread the mixture, forming large rectangles that cover 3/4ths of each baking pan. Use a flatware knife to score the fruit mixture into 2- or 3-inch squares. 7. Bake for 3 hours, then, turn the chews by inverting the slabs onto another piece of parchment. Bake for another 1 1/2 hours, or until well dried. Cool completely and break into pieces. Tropical Fruit Chews can be stored in heavy-duty zipper-lock plastic bags and kept at room temperature for up to two months. 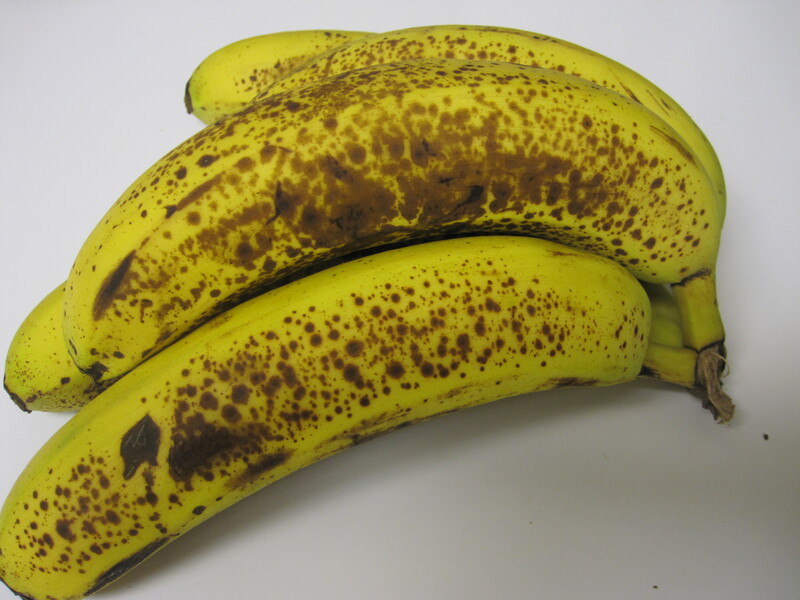 For longer storage, refrigerate them for up to 6 months. 8. TO DEHYDRATE THE TROPICAL NUT CHEWS, spread the fruit mixture onto 3 Teflex-lined dehydrator trays, score into 2-or 3-inch pieces with a flatware knife, and dehydrate at 115 degrees for about 12 hours. Invert the slabs onto the open dehydrator trays and dehydrate about 8 to 10 hours longer, or until thoroughly dried. Stored in heavy-duty zipper-lock plastic bags, the chews will keep at room temperature for up to 6 months. NOTE: If you prefer to use fresh coconut in place of the dried, purchase a mature coconut that is free of cracks and feels heavy with water. To crack it open, hold the coconut in the palm of your hand with the eyes facing either side. Hold the coconut over the kitchen sink and use the blunt end of a heavy-duty cleaver or chef’s knife to pound all around the perimeter of an imaginary line that goes through the center, between the eyes and the stem end. Turn the coconut as you pound. As soon as the coconut begins to crack, discard the coconut water into the sink. Use a small, firm paring knife to separate the coconut meat from the shell. Place the coconut meat into the food processor, in batches, and pulse chop it into a coarse meal or coarsely shred the pieces by hand. You will have about 4 to 5 cups of freshly grated coconut meat. Peanut lovers like me, who never tire of those crunchy, nutty-tasting wonders, always gravitate toward recipes that include them in any form. I’m also an avid fan of kale, raw or cooked. So I thought why not combine peanuts and kale. How could I miss? Slowly, another kale salad was beginning to take shape, but was still in the process of creative cultivation and ripening. What would the dominant flavor be? Would it be sweet, tart, savory, or a pungent kaleidoscope of all those flavors. The decision ultimately fell onto my taste buds. They were craving a kale salad with a taste-popping dressing that could be defined as sweet and sour, but also yearned for something pungent with a strong umami edge. That magical blend of flavors spoke to me from far-away places like Thailand or possibly Indonesia, where sweet and sour sauces are king and crafted so well. 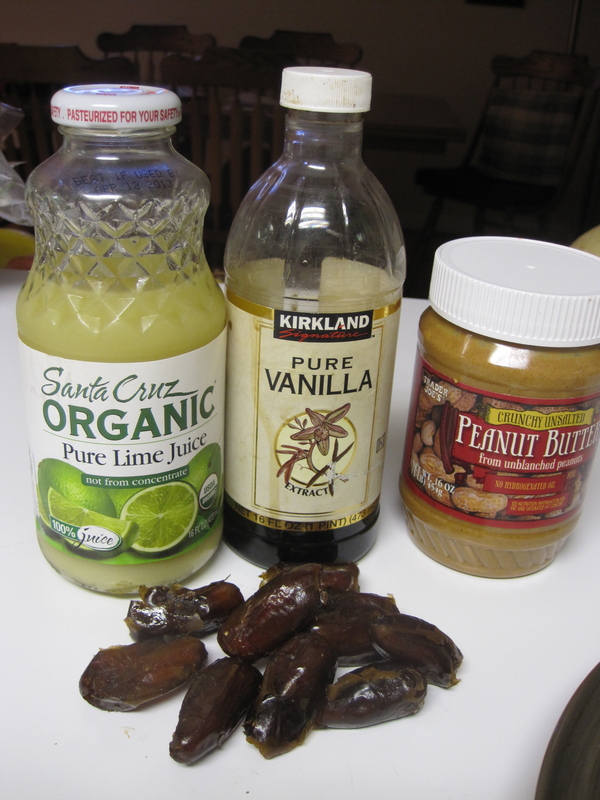 Starting with a crunchy peanut butter, I found it really easy to assemble a sweet and sour dressing within minutes. Smooth peanut butter would be all right, too, but I love the texture of those little tidbits of chopped peanuts that deliver a petite crunch with every forkful of the bite-size kale leaves. All I needed was a bowl, a wire whip, a measuring cup, and some measuring spoons. My feet sprung into action and led me instantly to “kitchenland”–my favorite little creative nook. I chose to include another ingredient, low-fat coconut milk, to lend richness to the dressing. It would certainly have been richer still with a thick coconut cream or full-fat coconut milk, but a little restraint delivered great flavor and far less fat, especially saturated fat, and fewer calories, for sure. I learned a little secret from a raw chef who makes heavenly kale salad. In working with raw kale to make it a little softer to the palate and to best infuse the dressing throughout, he lovingly and patiently massages the dressing into the kale pieces before adding other ingredients. The results are unmatched! The pampered kale salad becomes a divine symphony, rich with flavor notes and innovatively embellished with a chorus of sweet fruits and crunchy veggies. 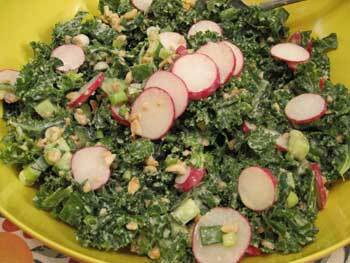 Enjoy the recipe along with the great health benefits from two highly nutritious gifts of nature–kale and peanuts. 1. Place the prepared kale into a large, deep bowl and set aside. 2. To prepare the Peanut Dressing, combine the peanut butter, coconut milk, lime juice, maple syrup, vinegar, soy sauce, garlic, and cayenne in a medium bowl and mix well with a wire whip until creamy and well blended. 3. Measure 3/4 cup of the Peanut Dressing and pour it over the kale. With clean hands, mix and massage the dressing into the kale until it is well incorporated and the kale is well coated. Refrigerate the remaining dressing for another salad. 4. Add the tangerines, hearts of palm, and cucumbers and toss well. Divide into 4 salad plates and garnish with the diced red bell peppers. Tuck it into the fridge and pour it over next day’s steamed veggies. Use it as a dressing over a pita sandwich filled with bean burgers and veggies. Pour it over coleslaw and toss well. Kale is barely visible in the American diet and often appears merely as background garnish on salad bars. Yet, kale is right at the top of the A-list of foods with the highest nutrient density. Packed with vitamin A, vitamin K, and the antioxidants beta carotene and lutein & zeazanthin, this leafy green ought to be highly praised and given an honored place in the diet several times a week. Hopefully, this tasty recipe will lure you into the kale den. You might even fall in love with kale after eating this salad because this kale has a partner to charm your taste buds and offer a pleasant crunch. Peanuts, also highly nutritious, are a great source of monounsaturated fat that helps to reduce the risk of cardiovascular disease. Often grouped with nuts, peanuts are actually in the legume family and are a rich source of the antioxidant resveratrol that helps to induce good blood flow to the heart and brain. The antioxidants in peanuts measure up to those fruits with the highest antioxidant levels: pomegranates, blackberries, and strawberries. You may be surprised to discover peanuts contain more antioxidants than apples, carrots, and beets. Kale makes a gorgeous display on the dinner table and certainly packs a hearty nutritional punch. Dotted with bright red radishes, crisp cucumbers, and crunchy bits of roasted peanuts, this earthy forest green salad is bathed in a rich and creamy dressing that instantly satisfies the savory palate. The secret to softening the kale and making it so much easier to eat is giving it a loving massage, a technique that infuses it with deeper flavor as well. This salad is a great keeper. If you don’t finish it in one sitting, you can tuck it into a covered container and keep it refrigerated for up to 3 or 4 days. 1. 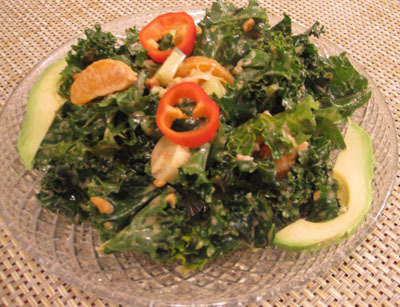 Place the kale into a large mixing bowl and pour the Cashew Caesar Salad Dressing over. Use your hands to massage the dressing into the kale, mixing and massaging for one full minute to soften the kale and infuse it with flavor. 3. Transfer the salad to an attractive serving bowl or platter and sprinkle the chopped avocado over the top. Caesar salad remains a long-standing favorite. The original dressing was made with a generous measure of Parmesan cheese, anchovies, and a raw egg in a base of olive oil. I’ve taken grand liberties with this oil-free, cashew-based dressing. Far from the standard Caesar, this tasty version has a rich character all its own. 1. 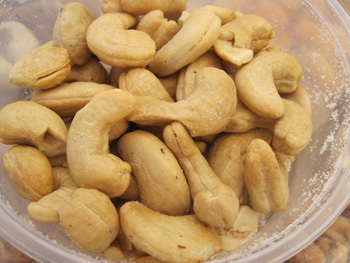 Place 1 cup of the water, cashews, and garlic into the blender and process until the cashews are broken down. If using a high-powered blender, you can place all the ingredients into the blender at once. 2. Add the remaining ingredients and process until thoroughly incorporated and the dressing is smooth and creamy. Use a funnel to transfer the dressing into a narrow-neck bottle for easier pouring. 3. Use immediately or chill until ready to use. Shake well before using. Refrigerated, the dressing will keep for up to 10 days. GOT PEANUT ALLERGIES? SUNFLOWER SEED BUTTER TO THE RESCUE! Peanut allergies can make life rather harrowing for those who must avoid even the smallest quantity of peanuts and any by-products containing peanuts. That means many of the delicious foods made from peanuts and peanut butters are strictly off limits. But sunflower seeds may come to the rescue! When I attended the Natural Products EXPO in Anaheim, California, in March, 2008, I enjoyed a pleasant encounter with SunGold Foods, Inc., a company that makes Sunbutter, a creamy product made of sunflower seeds. When I tasted their organic creamy Sunbutter, my first thought was that it was so like peanut butter I really thought it contained some peanuts. I was assured the smooth and rich-tasting “butter” was made only from roasted sunflower seeds—it didn’t even contain salt or sugar. It was thick, like peanut butter, and totally engaging. As I walked away from the booth, the thought of the sunflower seed butter clung to me like my favorite red sweater, and I knew a jar of it would soon become part of my regular pantry items. Several of the peanut butter recipes in my cookbook, The Nut Gourmet, will taste equally as delicious with this sunflower seed butter standing in for the peanut butter–recipes like the Peanut Butter Carob Pie, Yam and Nut Butter Soup, Chocolate Peanut Butter Mousse, Pistachio Peanut Bon Bons, and African Peanut Soup. And sunflower seeds are highly nutritious with plenty of protein, fiber, B vitamins, and Vitamin E. And as for the all-important minerals, they’re naturally packed with calcium, magnesium, potassium, selenium, iron, zinc, and copper. Sunflower seed butter–what a delight and what a treasure for those who will no longer have to miss out on a host of delicious peanut butter recipes! Armed with sunflower seed butter, peanut allergy sufferers and anyone who enjoys a flavorful and zesty dish can now make this delicious sauce for recipes like Indonesian Gado Gado or Satay. For this easy sauce that takes no more than 5 minutes to make, I would suggest using the unsalted and unsweetened variety. You can choose either the chunky or smooth texture. A word of caution is in order, though. For those with peanut and tree nut allergies, sunflower seeds and products made from them may possibly pose the same risks as consuming peanuts and tree nuts. Always read labels of any products you purchase to make sure they were not made in a facility that processes peanuts or tree nuts. The Sunbutter is made in a peanut and tree nut-free facility, but may still cause serious risks of severe reaction for some people. Combine all the ingredients, except the chives, in a small mixing bowl and stir with a whisk to blend the flavors. Stirring for a full minute creates a thicker sauce. Transfer to an attractive serving bowl and garnish with the chives. Serve as a dip for baked tofu or seitan, or spoon over steamed vegetables, cooked grains, or tossed salad. THIS LITTLE PEANUT WENT TO MARKET. . .
On the first weekend in March I was floating on a nut cloud and swimming in a warm and fuzzy nut pond. And if you’re as much of a nut butter lover as I am, I can assure you there was plenty to spread around. Every year on the first weekend in March, the Natural Products EXPO comes to the Anaheim convention center in California for the largest food show in the country. This is the premier event for food manufacturers and sellers to display their wares and introduce new food products to retail buyers, the press, and those with a related food focus. The convention halls were practically bursting at the seams with 1900 vendors and 53,000 people in a frenzied environment of food tasting and product samplings along with an impressive array of knock-your-socks-off food displays. As usual, I was trained on seeking nut products and trying to discover any unique ways nuts were being incorporated into good things to eat. Simply put, the experience was a banquet! And nuts were not the only items eager sellers were sampling. Peanut products won my popularity prize with the most vendors selling peanut butters, some purely organic, others enhanced with flavorings and palm oils to keep the nuts and the oils from separating. Many of the peanut companies posted notices on their websites stressing that none of their products came from the disgraceful Peanut Corporation of America responsible for all that contaminated peanut butter. Overall, nuts made an excellent showing, but the one disappointment for me was that none of the hot prepared foods contained nuts of any kind with the exception of a lonely Thai peanut sauce and a peanut tofu. Nuts are so nutritious and high in protein and fiber–why couldn’t they serve as an excellent replacement for other protein-containing foods like tofu, wheat gluten, or animal-based items? 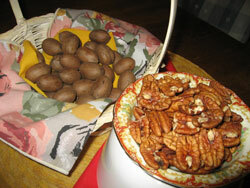 •	and nuts seasoned with everything from habanera chiles to onions and garlic. The most innovative new product I met at the market was peanut tofu. Though I was awe-struck at the moment, I later realized peanut tofu makes perfect sense—the Chinese employed the soybean in a unique process that turned it into tofu. The peanut is also a bean—so why not peanut tofu? Of all the nutty products at the EXPO, my personal blue ribbon award goes to Sunergia Soyfoods from Virginia for the most creative product I have ever encountered. If you’re into the vegetarian lifestyle, you know that tofu is a great source of plant-based protein. But would you ever imagine a tofu made from peanuts? This outrageously creative company came up with Nufu Peanut Tofu—a tofu made from peanuts in two tasty flavors—sesame ginger and herbed hickory. With great flavor and familiar tofu texture, this peanut tofu packs 5 grams of protein in a 2-ounce serving. I’m sold! Novel ideas always show up at the EXPO. One company, Justin’s Nut Butter from Colorado, came up with a hip way to package and sell nut butter—little one-ounce foil-wrapped nut butter squeeze packs perfect for moms to pack into kids’ lunch boxes. Smart marketing idea! They also make classic peanut butter and p-butter flavored with honey and cinnamon. Their classic almond butters are also perked up with honey or maple flavoring. To prevent the nut oils from separating, they add organic palm fruit oil to their products. Mrs. May’s Naturals from California attracted a pack of nut-loving snackers to gobble up their amazing nut crunches that feature every variety of slow-roasted nuts and seeds you can think of. Some are combined with sea salt and sweetened with organic sugar–others are simply blended with fruits to give them sweet appeal. But all of them are irresistible and often show up at parties like the Academy Awards gathering I attended recently. 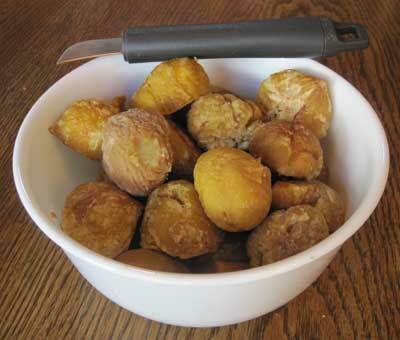 There were bowls of these crunchy babies on every table. One of my favorite standout products at the market was Sunbutter from North Dakota, a totally peanut-free butter made from roasted sunflower seeds. The unsweetened variety is my fave and is unbelievably tasty with nothing more than roasted sunflower seeds. 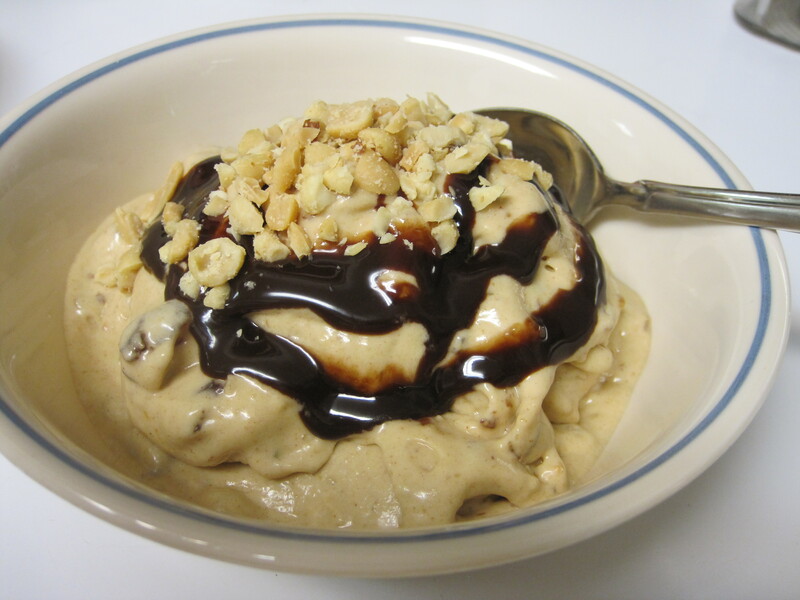 It’s got awesome flavor and is actually reminiscent of ultra creamy peanut butter. Anyone allergic to peanuts or tree nuts could safely enjoy this treat because it’s made in a peanut-free and tree-nut free processing plant. The other varieties include those made with organic sunflower seeds, sea salt, mixed tocopherols (those are fat-soluble antioxidants in the Vitamin E family), and evaporated cane juice (a fancy name for organic sugar). Yummy nuts made by Yumnuts Naturals from Connecticut truly are just that—a yummy snack food made with dry roasted cashews as the base. Each of the six varieties is coated with sweeteners like honey, corn syrup, and/or sugar. Some have other irresistible additions like cocoa powder, coconuts, salt, chili powder, lime juice, and zesty Cajun seasonings. 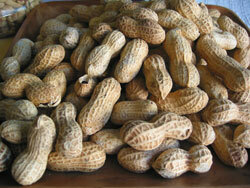 Virginia peanuts into each pod that finds their most nurturing climate in New Mexico. Their flavor- infused p-nutbutters are a riot with 13 different varieties. The vanilla cranberry pops with sweetness, the caramel feels all warm and fuzzy, and the spicy Southwestern zings with the perfect touch of chili heat. Here are some of the other wild and creative flavors: banana, raspberry, cinnamon, dark chocolate, sweet molasses, cinnamon currant, onion parsley, hickory smoked, and Thai ginger and red pepper. So many choices! Sweet Ella’s Organic Peanut Butter from Michigan comes in creamy and crunchy style and contains only two ingredients—peanuts and sea salt and it rocks the tastebuds! I’m a nut for the crunchy style and can honestly say it was delicious. This company, founded in 1910 by Ella Koeze’s great great grandfather who came to America from the Netherlands, is now celebrating its 99th birthday and carrying on a unique legacy. Their USDA certified organic peanut butter is made on vintage equipment and prepared in small batches. Cream-Nut Natural Peanut Butter is also made by the Koeze Company and contains only Virginia peanuts and salt. The difference is the Cream-Nut Brand is not made with organic nuts, but has the distinction of being produced on the same vintage equipment as Sweet Ella’s. Living Intentions from San Francisco has Gone Nuts! That’s what they call their line of raw, vegan, sprouted nut blends that totally lured me in with their captivating array of flavors. Who can resist a handful of sesame teriyaki flavored nuts, or cilantro lime mojo with pistachios and pepitas? And their sweet and spicy pistachios with chipotle–Whew! That’s one hot mama! I confess. I’ve got a soft spot for almond butter. Couldn’t resist Once Again Nut Butter whose brochure says “We spread integrity.” The company is a cooperative with a mission to help address Third World poverty by starting and supporting organic farm co-ops and paying U.S. prices to the growers. I had a great tasting session at their booth and loved their crunchy almond butter. It was pure heaven with nothing else added and nothing taken out. They also make the smooth along with one that includes flaxseed oil to provide omega 3 fatty acids. Other products include organic sunflower butter, cashew butter, and peanut butter, along with sesame tahini. Every preference is covered—smooth, crunchy, salted, unsalted. Still strolling through the peanut patch I struck gold when I reached Feridies from Virginia. And, naturally, Virginia peanuts were their specialty, though they did have cashews, almonds, and pistachios, too. This vendor had something for everyone—salted, unsalted, redskin, honey roasted, butter toffee, hickory smoked, hot & spicy, chocolate covered, Cajun spiced, garlic, and wasabi flavored—it was snacker’s heaven! It was obvious that Peanut Butter & Co. from New York likes to play in the kitchen and has fun naming their flavored peanut butters. Guess what’s in The Heat is On? Or Dark Chocolate Dreams? These special blends use organic palm oil to prevent the oil from separating, while Smooth Operator and Crunch Time are made from great tasting peanuts and salt. From their simple sandwich shop beginnings, their PB&J ‘wiches attracted dating couples, lunching execs, and even celebrities. Can’t you just taste their grilled peanut butter sandwich stuffed with bananas and honey? The Shangri-la of the Himalayas came to the EXPO via International Harvest from New York. All their products are raw and organic from Hunza and the world. I was literally compelled to stop and stare at their brilliant display of nutty trail mixes. The Himalayan Trail medley was a gorgeous combo of almonds, figs, apricot kernels, mulberries, golden raisins, and apricot halves. The Hunza Goji Trail added bright red-orange goji berries to the mix. It was so appealing I could barely control myself from stashing handfuls into my bag. 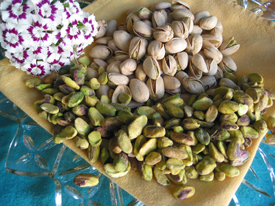 The company likes cashews and pistachios, too, and included them in other fruity mixes. And then there was Amoretti, an awesome company that makes unique products especially for chefs and the food industry. Their focus is outrageously cool things like almond pastes, marzipans, nut pralines, nut flours, nut and fruit ganaches, and pistachio dessert sauce. Another section of their catalog featured nutty flavoring syrups in almond, chestnut, praline, hazelnut, macadamia, pistachio, and walnut flavors. And wildest of all food products are their edible food perfume sprays with the scent of almond, amaretto, coconut, hazelnut, or pistachio. Wouldn’t that make dessert impossible to resist with those fragrant aromas perfuming the air right under your nose? And have you ever seen gold or silver French Almond Dragees? They were gleaming brilliantly in the company’s stunning catalog. I can easily imagine a platter of gold and silver-coated candied almonds presented at an elegant event! Wickedly delicious is the hottest way to express the nirvana that greeted my taste buds at the Mudslinger’s booth. Their ice cream-like frozen desserts are decadently delicious and creamy to the max. My best pics were the soy milk-based Peanut Butter Palooka and the coconut milk-based Coconut Pecan Praline. Am I a crazy nut lover, or what? Primex Farms in California is a very cool company that not only grows, roasts, and packs their whole and shelled pistachios, but they also promote the sale of almonds, hazelnuts, walnuts, peanuts, and pine nuts along with some fruits grown by other farms. They call themselves traders, an old-fashioned term, and sell the nuts all over the world. When I asked about their charismatic display, they presented me with an awesome press kit from the California Almond Board. 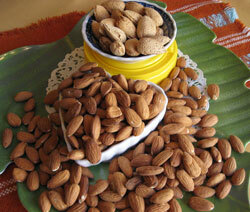 I soon discovered there are more California almond varieties than I was aware of—10 in all. The press kit contains such an array of almond information it was like taking a course that begins with almond horticulture and ends with processing and storing the nuts. That is one savvy organization. Coconuts made a lively debut in Turtle Mountain’s coconut milk non-dairy frozen dessert made from the first pressing of the coconut meat. The result is a decadently rich coconut-cream-based-frozen dessert that just oozes with creamy richness. The company aptly named this delicious treat Purely Decadent. Even better, they’ve used this coconut milk base to create two exquisite flavors–mocha almond fudge and peanut butter zig zag. Making creative use of the coconut shells most of us would likely toss out, Coco Loco made magic with them and brought coconut shell jewelry to the EXPO. In an attractive display the company presented a line of jewelry one could wear from head to toe—literally. There were coconut shell hair sticks and coconut shell toe rings. And for the in-between parts the display included earrings, rings, pendants, nose rings, necklaces, and bracelets. At the end of that tasting weekend I had to take my tummy home for a much needed rest and a nutty detox with a peanut butter and jelly sandwich. 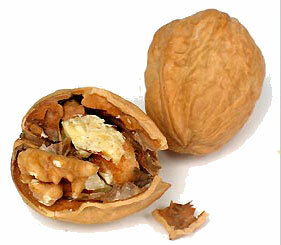 Nuts add pleasure to my life in countless ways. I appreciate them for adding spark to my recipes. I love them for their delicious flavor. I am grateful for their health benefits. I enjoy their pleasing crunch. But, that’s not all. I love nuts for their literary charisma and for bringing a smile to my day. Check out the quotes below—perhaps they’ll make you smile, too. 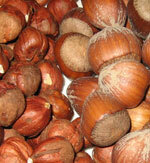 I thought it might be helpful to have an overview of the nutritional highlights of tree nuts. While this listing is certainly a good quick reference, it only scratches the surface of the plethora of health benefits nuts have to offer. It may seem that I’m promoting nuts as some sort of miracle food. Not so. I’m just recognizing nuts are one of Mother Nature’s many gems that are packed with goodness, especially when paired with other foods that are nutrient-dense and low in saturated fats. Arginine –an amino acid that changes into nitric oxide that relaxes blood vessels and permits better blood flow. May help alleviate coronary artery disease like chest pain and clogged arteries (called atherosclerosis). Folate – also known as folic acid or folacin, a form of the water-soluble Vitamin B9. Occurs naturally in food and can also be taken as a supplement. Helps prevent neural tube birth defects. •	High in vitamin E.
•	High in beneficial monounsaturated fat. 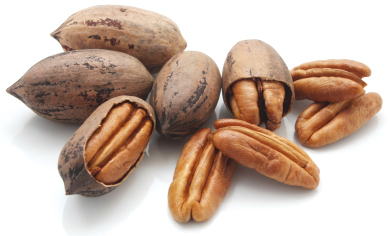 •	Good source of protein, calcium, iron, copper, and zinc.